SolaRay infrared heating panels employ the latest radiant heating technology coupled with high performance materials. Our panels have unsurpassed reliability, are Built in America using only American materials and manufactured in Olympia, Washington. At Ducoterra, we stand behind our infrared heating panels no-maintenance promise by backing every panel with the industry-leading Lifetime Warranty. This means you can rest assured that your investment will deliver on the promise of a lifetime of maintenance and hassle-free heating. 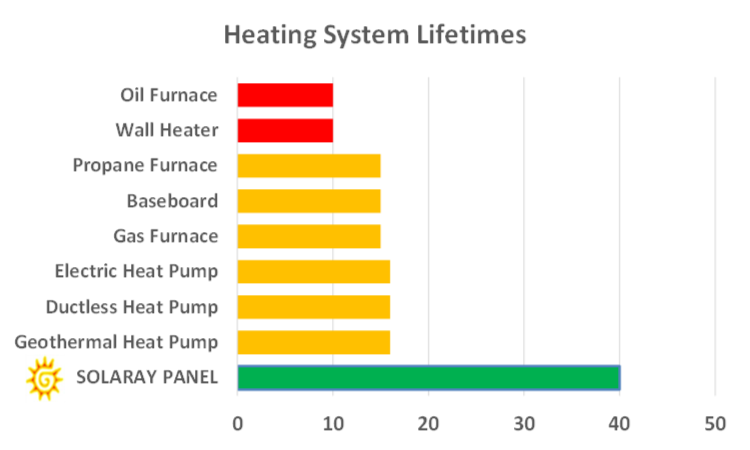 Compare our reliability and longevity to 10 years for an electric wall heater, or 16 years for a furnace, electric heat pump, geothermal heat pump, or ductless heat pump. In comparison, over a 30 year period, for example you will have to buy 4 wall heaters or 3 heat pumps or furnaces versus buying just one Ducoterra SolaRay infared heating system. And with Ducoterra’s SolaRay panels, our customers avoid the nuisance and expense of annual maintenance. What this means to you is cost savings AND not having the inconvenience or nuisance of having your heating system replaced many times during the lifetime of your home, or having it break down in the middle of winter and paying for an emergency repair.